Category Archive for "Shipping Services"
The local Post Offices usually experience high demand during the holidays, the educated consumer knows that their time is very valuable to stand in long lines and often seeks other alternatives like independent shipping centers and Postal Service Vendors. Neighborhood Parcel is the ideal choice for anyone looking to ship their holiday packages or any parcel for that matter. Neighborhood Parcel is the official FedEx Authorized shipping center for Lowell, Tewksbury, Dracut, Wilmington, Woburn, and Billerica. Offering a wide range of shipping services: Express, International, Ground, and Freight services. From packaging to address correction, Neighborhood Parcel staff will help you navigate the complex world of shipping and save you money along the way. 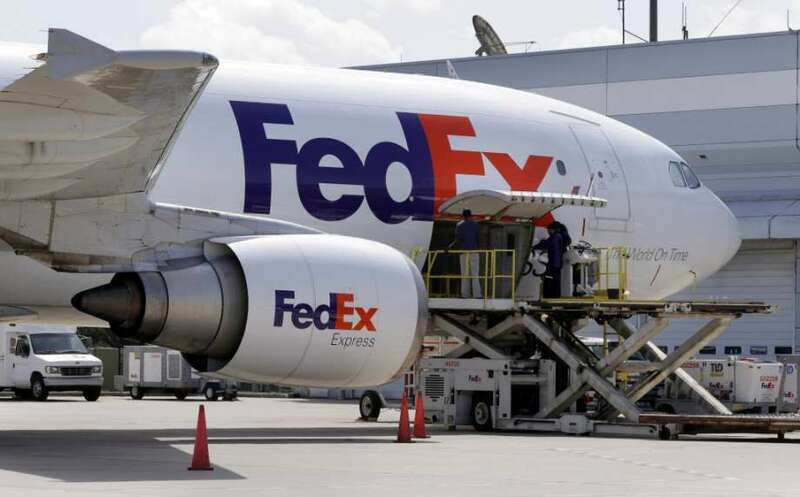 We can also help process your eBay, Amazon, Zappos and Car parts returns because we are the #1 choice for FedEx Drop-offs. UPS FedEx DHL Coupons, shipping discount coupons for FedEx Ground, Express and International shipping. 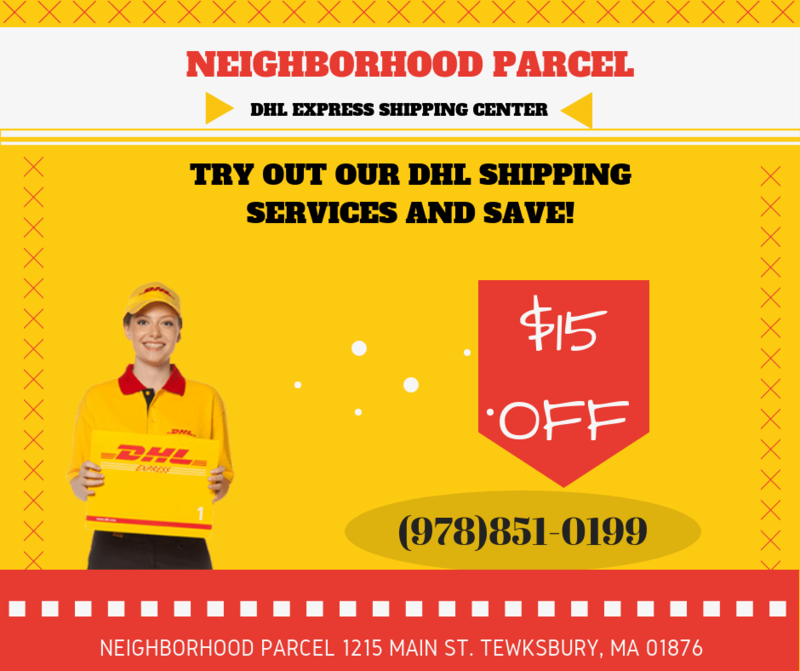 Save up to %15 off your next DHL shipment in Lowell, Tewksbury, Dracut, Andover, Haverhill, Lawrence and Methuen MA. I used to hate going to the Tewksbury post office and wast my time waiting in long lines. Neighborhood Parcel is a Post Office vendor and they offer the same services as the Tewksbury Post Office without the long waits, the lousy service! This is a great alternative that I am recommending if you like to ship your gifts or care packages this holiday season. They ship using first class mail, priority mail, express mail, and Media Mail. They also sell stamps! I highly recommend this location to ship your letters and packages to Africa. Their staff is kind, always smiling and willing to help me. My DHL letters arrive on time, the tracking service is accurate and they often have the lowest rates and no hidden fees. I don’t like using the DHL.com website, I find it confusing and they often charge me extra for pickup fees and hidden fees. I recommend this service to anyone looking for the best DHL rates and great service around Lowell MA. We are expanding our office hours to allow to ship your packages after hours and on Saturdays! Our Tewksbury MA office location is your trusted FedEx, UPS and USPS Shipping center and we will be glad to help you ship your gifts so they can arrive on time for the Holidays. Chose from Ground, Express and Same Day delivery options. For that awkward gift, bring it to our center for same day packaging! Unlike the UPS Stores and FedEx Offices, we pay no loyalty or Franchise fees, you will find our rates to be very affordable and the service to be what you would expect from a World organization. Neighborhood Parcel of Tewksbury MA is your local authorized FedEx shipping center, serving the Merrimack Valley since 2007. We offer Ground, Express and International shipping services for small to medium packages in addition to being the most trust FedEx Drop-off location for all your prepaid returns from Amazon, Walmart, Zappos, Apple, Dell, LLbean and online retailers. Holiday shipping season is upon us! Let Neighborhood Parcel handle all your shipping and packaging this season! Ship Early and save! The new FedEx and UPS Ground shipping rates are much lower than the US Post Office Priority Mail rates! Avoid waiting in long lines and come to Neighborhood Parcel for quick and easy shipping service. This holiday season, save even more on your shipping services via FedEx Express, Ground and International when you use the services of Neighborhood Parcel. The latest FedEx Shipping Rates are much cheaper than USPS Priority Mail and come with additional features you can not find at your Post Office!